Pull the handle and walk in with a look of confusion and delight as you’re teleported from a vending machine to a room of naked concrete walls, exposed beams, and mix of vintage knick knacks. It’s Tuesday night at the Soda Factory, which means only one thing… $1 hot dogs, yes, ONE dollar! 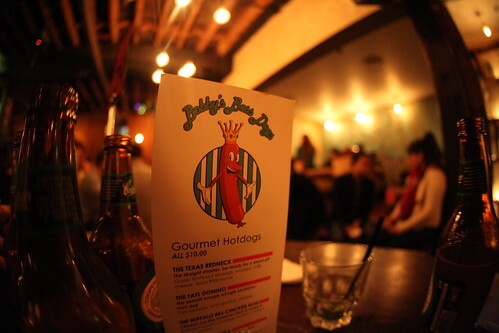 It’s packed to the rim with diners sitting on on each corner, edge of space with a beer and hot dog in hand. With our eagle eyes, we eye an table and pounce before the diners have even put on their jackets (I later realised that you can book a spot, which is highly recommended!). With beers in tow, the hot favourite is the Buffalo Bill Chicken Dog; a crispy, battered sausage and a mountain of melted cheese. 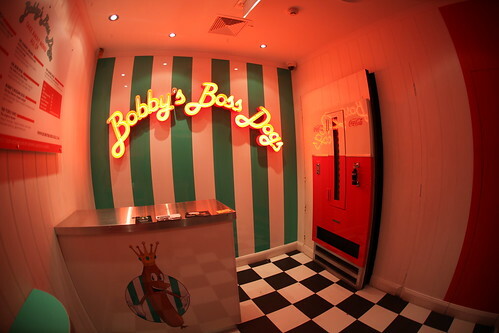 But if you’re a fan of the classic mustard and dog, it’s still on the menu but with an onion ring twist, or if lamb takes your fancy, Bobby’s Bogan Dog topped with mushy, smashed peas. By the third, yes, the chewing becomes tiresome and it’s a carblicious overload. 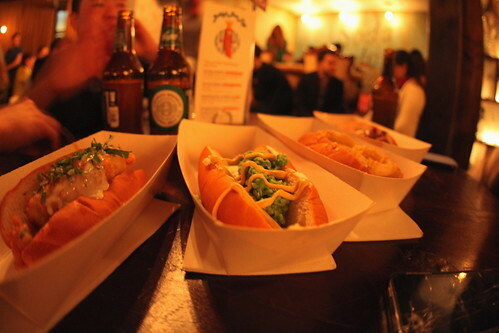 These are some damn good hot dogs considering they bear the price tag of a dollar, so be prepared for a night of gluttony. The Soda Factory also runs Movie nights on Mondays, Pulp Fiction Wednesdays and Mad Men Thursdays. You gotta give it to these guys for packing out the bar on a school night. Sounds really interesting here with some great themes and comfort food. Must give it a go some time! These dogs are bang for buck! those hot dogs look very delicious. great bargain too! You’re alive! LOL heard about these $1 hot dogs.. best dinner ever!